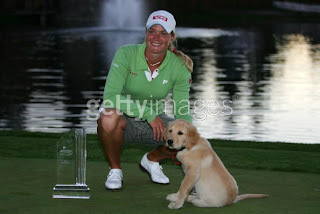 Suzann Pettersen laid solid claim to the #2 spot in the HD Rankings with her victory on Sunday. I had been waiting for one of the Pettersen-Creamer-Pressel-MH Kim foursome to step forward. Expect to see the Top 30 updated here in a couple of weeks. Pettersen is now 2-0 in playoffs, with both victories this year. That’s not too surprising, given her past match play record. What is surprising – Lorena Ochoa is now 1-5 in playoffs. It is hard to win a playoff when your opponent birdies every hole. Is Blackhawk Country Club located next door to Old MacDonald’s farm? In addition to the mooing cows and barking dogs we heard on the telecasts, Larry Smich reported turkeys wandering alongside one fairway. That's the club-dog Bogey posing with Suzann in the picture above. Lorie Kane didn’t have the Sunday she wanted, but by finishing tied for fourth she got her first Top 10 of the year and the Big Surprise Award. Morgan Pressel was the Big Disappointment, barely making the cut and stumbling to a T60 finish at +10. Nancy Scranton’s 16th place finish earned her $15,296 and put her in 89th place on the money list, securing an exemption for 2008. Liselotte Neumann didn’t have to burn her Code 7 this year – she earned $5359 and wound up 90th. Dina Ammaccapane missed out by less than $800 – she’s #91 after finishing T44. Dina finished one stroke behind Neumann at Longs, and the money difference of that one stroke ($949) was more than the difference between places 90 and 91. #92 Minea Blomqvist entered the week at #90, played her way into the event in Monday qualifying, and went into the weekend at T38. Had she maintained that position, the extra $3000 would have been enough to stay in the top 90. Rounds of 75 and 76 dropped her to T58. #93 Jill McGill finished T26, but like Blomqvist came up about $2500 short – both players used exactly two strokes too many at Longs. #94 Katie Futcher made the cut but only ended up T63 and nearly $9000 short of the top 90. She would have had to shave off 11 strokes somewhere to make it. Last week I proclaimed Sherri Turner a lock for the top 90 and she did make it. However, since so many players made the Longs cut, Sherri only finished about $2000 clear of player #91. I hope she wasn’t sweating it out too badly on Sunday! In my original Make-or-Break post, I predicted that both Sherri and Dina Ammaccapane would drop out so I only got one of those right while completely missing on who would jump in (I picked McGill and Blomqvist). As it turns out, Futcher dropped out instead of Turner, and Scranton and Lorie Kane jumped into the Top 90. In the last two weeks, Kane vaulted from #102 to #70, earning over $66,000 and doubling her season’s total. Quite a resurgence there.